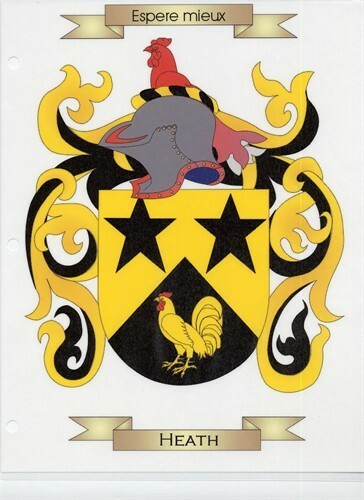 John HEATH (1573 – 1644) was Alex’s 11th Great Grandfather; one of 4,096 in this generation of the Miller line. Alis Bartholomew was born 1574 in St Martins, Wiltshire, England. Her parents were Thomas BARTELMEW and Alys CORDRAY. Alise died in Salisbury, Wiltshire, England. Many genealogies say Alis died 12 Feb 1599, but this was the date of her wedding and too soon for any of the children to be born. 1. John Heath Salisbury St Martins, Wiltshire, England Will, dated 28 Dec 1674, proved 10 Apr 1675. ~1640 Newbury, Mass 15 Jan 1681 Haverhill, Essex, Mass. Alis’ mother Alys CORDAY was born in 1543 in Chute, Wiltshire, England. Her parents were Thomas CORDEROY (1490 – 1581) and Jane MORRIS (1523 – 1598). Alis died in 1599 in Chute, Wiltshire, England. “I have ben att sence I have ben in my Cousin John Heath’s house to be paid out of my estate,” and then gave 40 shillings to Haverhill Church; 40 s. to “the College at Cambridge”; 40s. 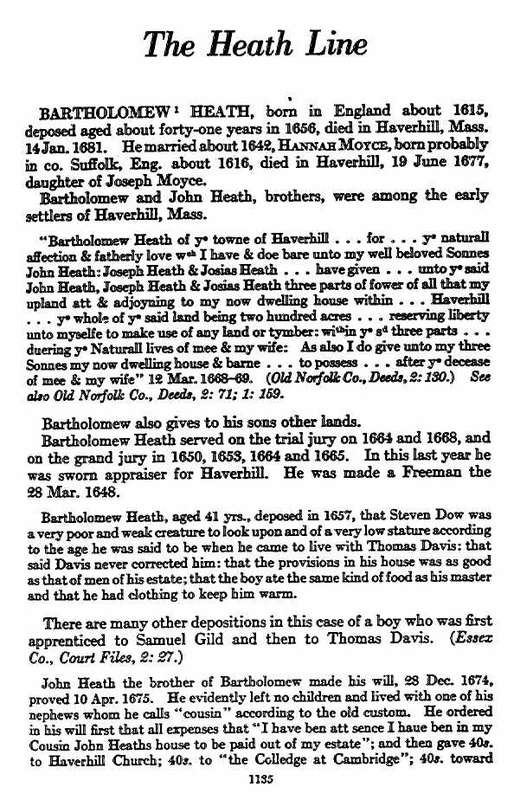 toward procuring a minister for the Church at Haverhill after Mr. Ward’s decease; 5 pounds to “my couzen Matha which was my couzen Joseph Heath’s wife, which is now wife to Joseph Page; Couzen John Heath’s Son Bartholomew a two yerling Cote”; to “Couzen Joseph Heath ten pounds if he come to age of twenty one yere”; to “Josias Heath’s son Josias a little colt”; to “Sias Heath, five acrese of Land in the plaine,” etc. 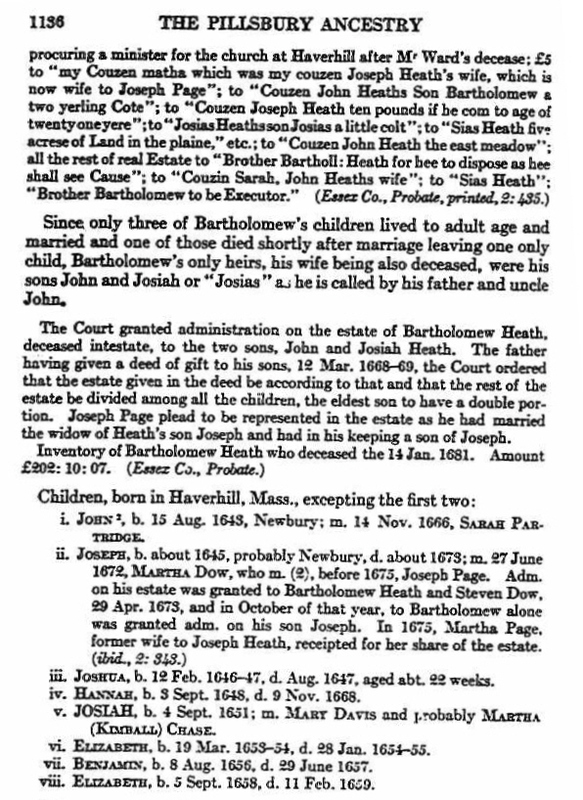 to “Couzen John Heath the east meadow, all the rest of real Estate to Brother Bartholl Heath for hee to dispose as he shall see Cause”; to “Couzen Sarah, John Heath’s wife”, to “sias Heath” “Brother Barolomew to be Executor.” (Essex County, Probate Records, 2: 43).